Your Hair Deserves Only the Best Shampoos, Conditioners, Hair Styling, and Highlighting Products! From care to color, L’ANZA heals, seals, and protects hair around the world. They utilize the latest technology available to keep product performance ahead of the rest. While many haircare lines claim they repair the hair, L’ANZA is the only brand able to heal the hair, delivering maximum shine and color that lasts. L’ANZA maintains a green commitment by ensuring that all their products and actions support a healthy and sustainable Earth. Loma hair care products are high-performing with naturally healing organic ingredients and essential oil-based fragrances. They pioneered and set the standard for the use of Certified Organic Aloe Vera Gel, the primary base for all Loma products; and their manufacturing facility is located 9 miles from one of the cleanest water sources in the world. 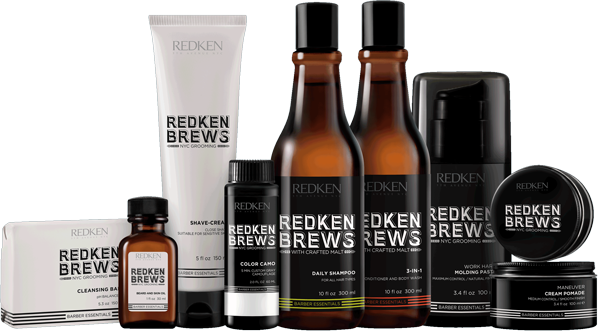 Get the men's haircare, men's hairstyling, grooming, beard and face products you need with Redken Brews. Choose from men's shampoo and men's conditioner to meet your unique haircare needs. From there, choose from an array of men's hairstyling products like hair gel for men, a selection of hair pomades, hairspray for men, and men's hair paste to complete your hairstyle. Take better care of your skin with new grooming, beard and face products by Redken Brews. Cleanse your skin with a men's soap that has a perfectly balanced pH to avoid dryness and tightness. For your facial hair needs, try Redken's newest men's shaving cream, or add a drop of beard oil to nourish your facial hair and combat any dry skin underneath your beard. The Go-To Salon in Honeoye Falls' for the Best Haircuts, Hair Styling, Hair Coloring, Highlighting, and Waxing!